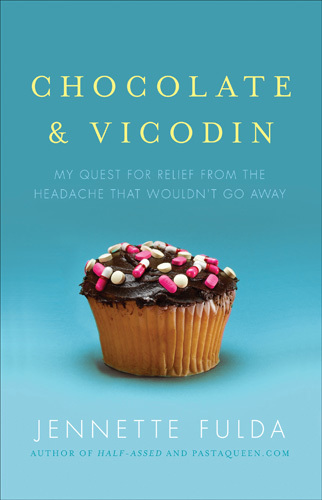 Today is a perfect day to write about Jennette Fulda’s book, Chocolate and Vicodin, because today I have a massive headache. Most of my headaches are triggered by changes in the weather and barometric pressure and they can last for up to three days. You don’t want to know me during one of my days-long headaches. I don’t even want to know me during one of those headaches. Jennette has a headache that has lasted for several years. YEARS!!!! I can’t even imagine what kind of chaos that would create in my life, but Jennette persevered and tried everything she could think of to cure the headache. Then she wrote a book about it; and it is a freaking hilarious book. I first heard about Jennette and her headache when she was interviewed by Carla and Shauna at Two Fit Chicks and a Microphone. I feel silly admitting this, but as much as I wanted to read her book when I heard her interview, I was actually scared that just reading about a massive headache would trigger a headache for me. I know, silly, but never underestimate the power of suggestion. If you have ever dealt with chronic pain, or just a really big headache, this book is worth reading. Here is what the publisher has to say about the book. You can also visit Jennette over at her brand new blog JenFul! Happy Reading Everyone!